Right now, we have an abundance of vegetables coming from our garden, far more than we can easily consume. Bell peppers. Onions. Tomatoes. Broccoli. Green beans. They’re all coming in at once. Naturally, that means we’re eating these vegetables a lot. They serve as side dishes in many of our meals and, when we think up an idea, they also serve as the main course for a meal or two. Here, we’re doing something very simple with the vegetables. We simply cut up some vegetables from the garden, cook them over high heat with a bit of water, add some rice noodles and a bit of sauce, and we suddenly have a wonderful simple meal. All you really need are rice noodles (dry ones are fine), some sauce that you like (soy sauce is fine, or you can try teriyaki sauce or countless other sauces), and some vegetables from your garden. That’s really all you need! The biggest step in this entire process is simply chopping up all of the vegetables. 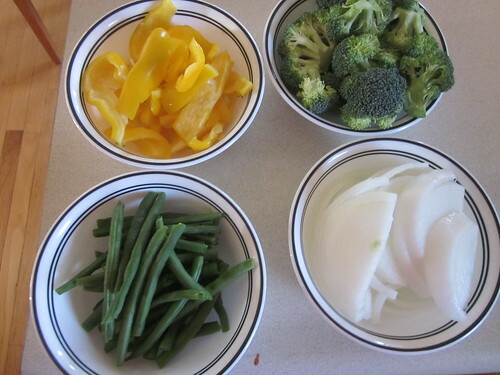 In this, we used a bell pepper, some green beans, some broccoli, and half of an onion. Almost any vegetable that’s fresh from your garden would work. I’d use tomatoes, potatoes, peas – almost anything that would come out of our garden would be fine in this. Don’t worry about amounts too much, either. 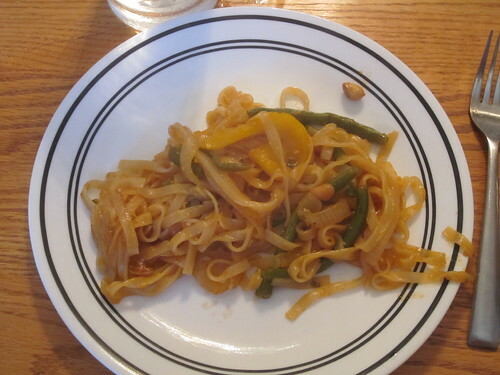 I try to have two parts overall vegetables to one part rice noodles by precooked weight, but you can really do whatever you’d like. You’ll find that the noodles (if anything) expand during this and the vegetables definitely shrink, so it will seem like there are as many noodles as vegetables when you’re done (if not more noodles). 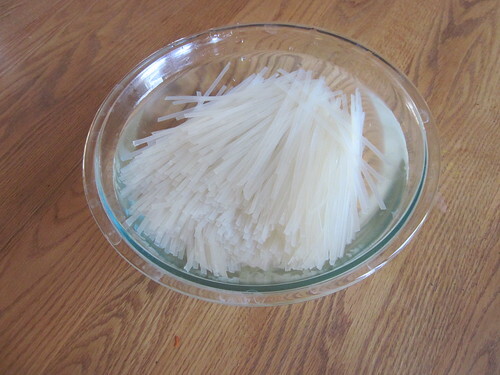 About half an hour before you’re going to add them, put the dry rice noodles you have in a bowl of water. This will make them perfect for cooking. If you have wet rice noodles (some stores sell them), just wait until you’re ready to add them. When you’re ready to cook, simply add a bit of water to a large pot, turn the heat up high until the water is boiling then throw in your vegetables. I suggest putting them in in order of toughness, with the toughest vegetables first. Wait a minute or two, then add the next vegetable. In our case, I started with the onions and peppers together, waited about three minutes, added the beans, waited another three minutes, then added the broccoli. Keep stirring throughout this so it doesn’t burn to the bottom, and add a bit of water occasionally to keep deglazing the bottom of the pan (the flavor is delicious). Wait until the vegetables are just a little bit less tender than you’d like (by taste-testing, of course), then add the rice noodles and the sauce you wish to use. Keep stirring for roughly seven more minutes, then remove it from the heat and serve. Delicious, incredibly simple, and pretty inexpensive! It’s a home run for us! This dish is so incredibly flexible. You can pretty much add any garden vegetable you wish to the mix. You can add pretty much any sauce to the mix that you’d like, too. 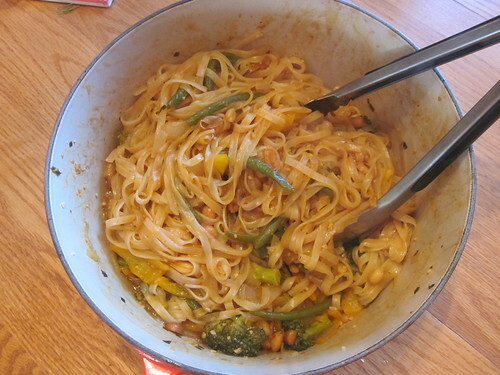 Amounts are pretty flexible, too, though I try to stick to about two parts pre-cooked vegetables to one part noodles. Just try whatever you have on hand and whatever sounds good to you.